People around the world have different preferences when it comes to dating. Australian men like their partner to respect their love of sports, for example, and Californians love their hiking dates. 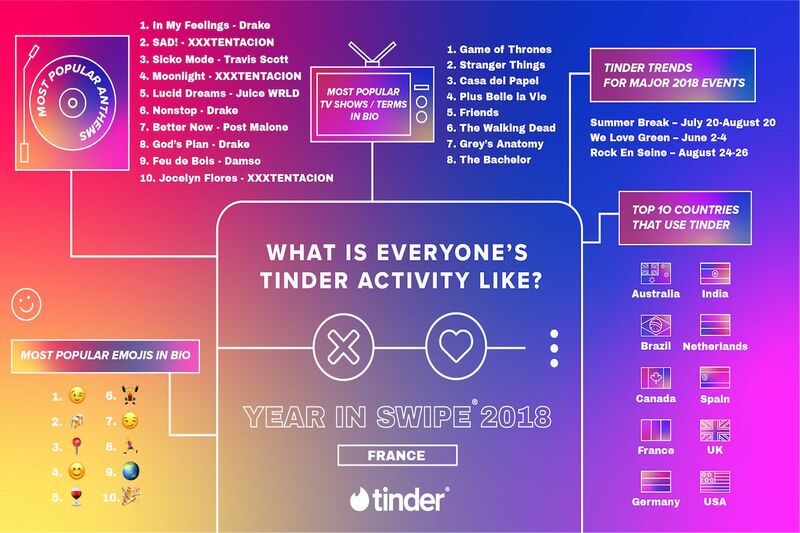 Tinder, with all its swipe-filled data, is taking note of those differences we all have and sharing them with the world in what it’s calling the Year in Swipe. The data encompasses profiles from 11 countries: the US, the UK, Australia, Brazil, France, Germany, India, Japan, Korea, Russia, and Spain. 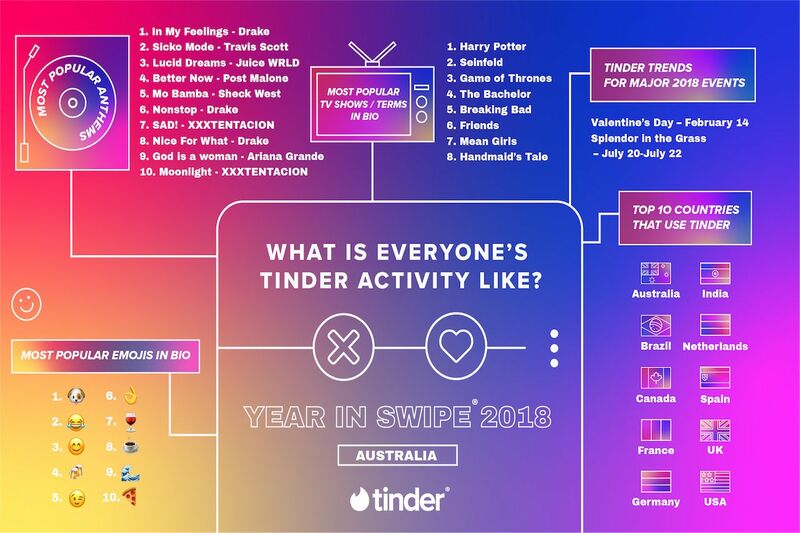 From the top song in people’s profile (Drake’s “In My Feelings” was number one no matter the country) to the most used GIFs (“How you doin’?”), it turns out how we Tinder says a lot about our similarities — and our differences. 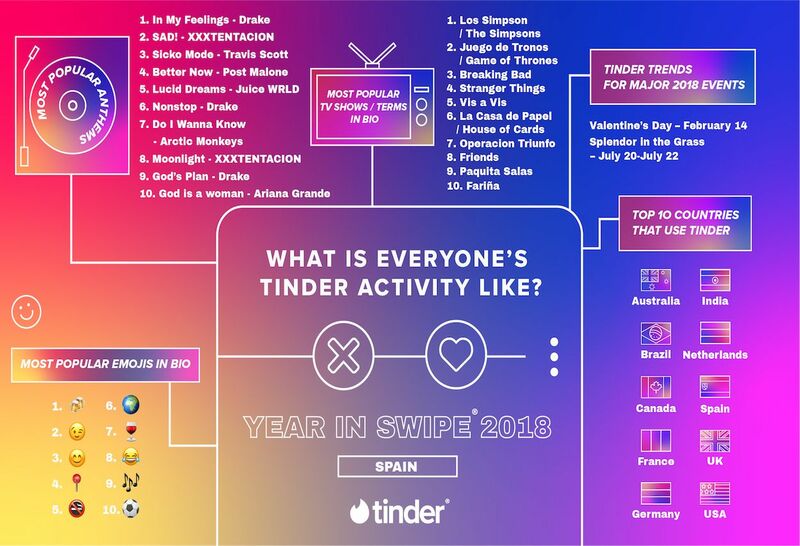 Even if you’re not a Tinder user, the data gives some interesting insight into how different cultures find love. Most of the dating world loves to travel. Travel is a big thing for the dating world. Travel, or traveling, is the most popular term in people’s bio in Australia, France, Germany, Spain, and the UK. It’s the second most popular term in Brazil (after “bar”) and the US (after the ever ambiguous “fun”). Travel fell to the fourth most popular bio term in Korea and Russia. The only two countries where travel didn’t make the top 10 most used bio words was in Japan and India. Wine, beer, and pizza are universal signifiers of love. 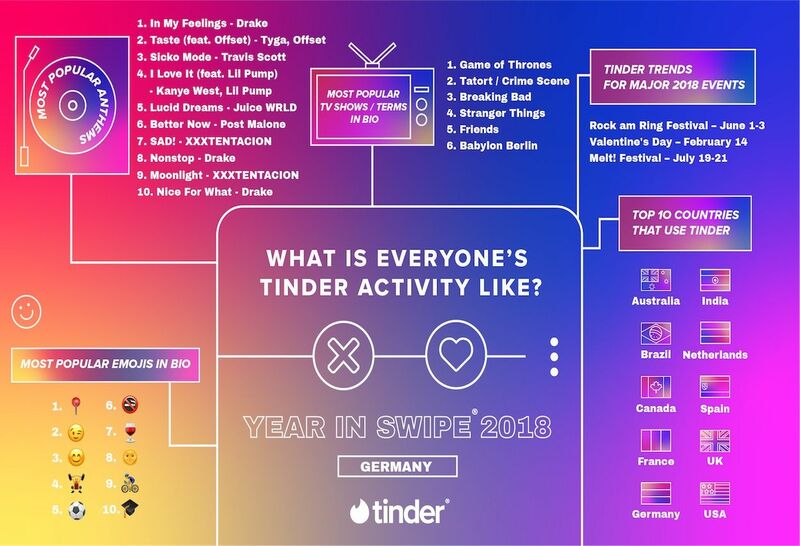 Wine and beer were the most popular foods mentioned in bios from just about every country Tinder released data for. In Australia, wine and beer are the two most popular foods listed in bios (rosé and Aperol spritz make it in at 10th and 11th most popular). This being 2018, people are largely expressing their preferences via emoji. Russia and the UK are the only countries where wine or beer aren’t in the top 10 most popular emojis used in bios. Beer also didn’t make a top 10 appearance in Germany, one of the countries most associated with the beverage. But when you’re in the country that started Oktoberfest, beer is a bit of a given. Monday is a good day to find a mate no matter where you are. 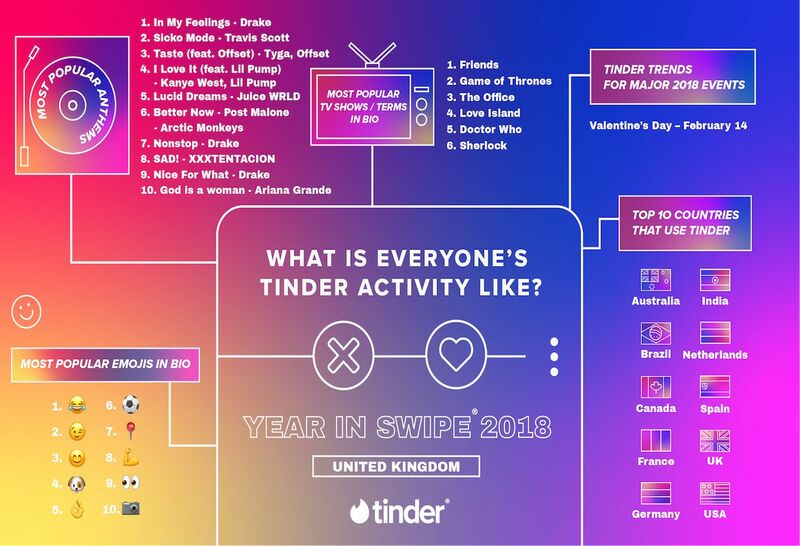 Monday was the most popular day to use Tinder in eight of the 11 countries the app has data for. The three places where another day is most popular are Japan (where Sunday is the most popular day), India (Tuesday), and Brazil (Tuesday). All of the days are early in the week, which goes to show that if you want a weekend partner, you have to start early.